So... My nails have been naked for two days now. I wanted to keep them that way for 2 weeks. But I don't know if I can do it. It's my Birthday on Friday, I couldn't imagine not wearing nail polish. So, we shall see. Speaking of Birthdays, StBF said she should have bought me a cat because all the bloggers seem to have cats. If I had a cat, I'd fit in better. Lol. Now onto the polish. My bottle so doesn't have a label on the bottom. But I'm 99% sure this is the right polish. Anyhow, this is an amazing deep purple holo. It's not as holo-y as some holos I've worn, but it's still gorgeous. As you will see shortly, I've been experimenting with poses and with a blue flower. 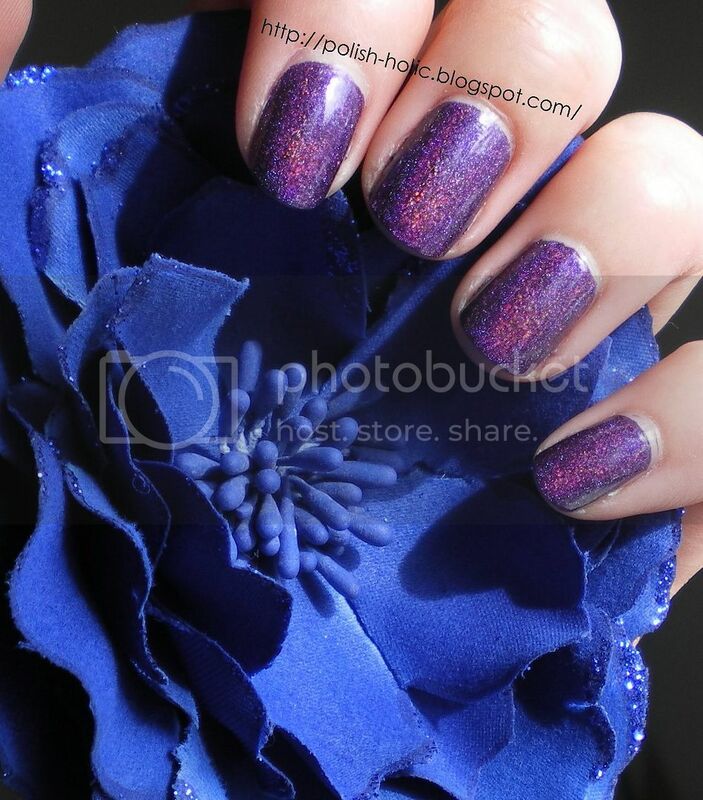 I was hoping the blue flower would reduce blue-skew when photographing purple polishes. I can't really tell if it makes a difference or not. But anyway, have a looksee! All pics taken in direct sunlight. I love how it changes colours when you change the angle. This is hours of entertainment for me. Two coats with topcoat. It's almost perfect in one, but I did two just in case. No drag at all. Edit 2: I would now like to draw your attention to my mushroom on the right. It's a candy holder. Hehehe. I feel like a bunch of us are wearing this all at the same time. There are a couple other bloggers that have also blogged about this in the past week. Definitely great minds, dear. I want that polish bad! Congrats on the big win! I can't believe this is in my untrieds. So mesmerizing! And your mushroom reminds me of mario :] I need to dig out my old super nintendo now! KrisInPhilly: I know eh? I have so many amazing polishes in my untrieds too. nihrida: I highly recommend it. KONADomania: Hope you like it! Stephanie: Hahaha, I totally thought of you when I was taking the pic. I took my polish off on Thursday morning and wanted to give my nails a week long breather. But I think I'm over it. My nails are in pretty good condition, and I've got a thousand polishes I haven't even tried yet! "StBF said she should have bought me a cat because all the bloggers seem to have cats. If I had a cat, I'd fit in better. Lol." Lol, indeed! That is fabu. Ugh, I think I've mentioned this before but I canNOT believe I still don't own a single, true-blue holo polish! Also, belated Congratz on the win! And I did see that Mushroom when it was up: so cute! Lucky on the nice nails front. Take good care of them! And really? Not a single one? For me, holos were like my first novelty sort of polish. I loved them. Now that I think about it I do have OPI My Private Jet. I think it might actually be the holo version, but it has been so long since I've worn it that I can't quite remember. Maybe yes, maybe no. Wear it! Find out! Hahaha.